Special contribution accounting considerations, including issues related to noncash contributions, contributed services, and fair value measurements. Special contribution operating considerations, including capturing and documenting contributions and agency transactions, avoiding problems associated with receiving contributions, innovative fund-raising techniques, governance, internal control, fraud, analytical procedures, budgeting, and tax considerations related to contributions. An entire chapter devoted to discussions on contributions arising from split-interest agreements. Over 325 real-life scenarios and examples that help you address almost every situation you might encounter related to contributions received by a nonprofit organization. 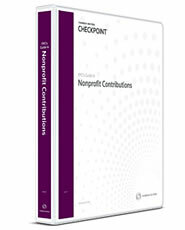 This Guide provides you with critical information, thoroughly updated guidance, and current insights affecting nonprofit organizations. If you provide services to organizations that receive grants and contributions, this Guide is a must.